Julian Nott passed away peacefully on 26th March, 2019 after suffering multiple injuries from an extraordinary and unforeseeable accident following a successful balloon flight and landing in a remote area near Warner Springs, California on Sunday 24th March. His loving partner of 30 years, artist Anne Luther, was at his side. Julian was flying an all new experimental balloon that he invented, designed to test high altitude technology. Julian was changing the course of balloon history with the development of an entirely new system in which conventional ballast is replaced with cryogenic helium. It appears that he was injured about three hours after the landing. ‘Whilst making the pressurised cabin secure it tumbled 500 feet down the mountain with him inside. As result he sustained multiple head (and other) injuries’, reported Roberta Greene, a spokeswoman for Nott’s family, in an email. A short piece on the accident can be found on his website. Our deepest sympathy goes out to his family and friends. Known as the founder of the modern ballooning movement, and one of its most creative and innovative exponents, Julian was changing the course of balloon history with the development of an entirely new system in which conventional ballast is replaced with cryogenic helium. He broke 79 World Ballooning Records and 96 British Records, including exceeding 55,000 feet in a hot air balloon. The Smithsonian Air and Space Museum has described Julian as “a central figure in the expansion of ballooning as an organizer, pilot, and most of all as arguably the leading figure to apply modern science to manned balloon design.” According to the Federation Aeronautique Internationale, also known as the FAI or the World Air Sports Federation, Julian also set a Guinness World Record in 2017, at age 72, for the highest documented tandem skydiving jump, from 31,916 feet (9,727 meters). In 2014, he helped Alan Eustace break the record for the world’s highest parachute jump, from an altitude of 135,890 feet (41,419 meters). The FAI website also lists dozens of his other world records for feats of altitude, distance and time aloft. His partner, Anne Luther, his brother Robert Nott, and nieces Elizabeth Salmon and Katherine Nott survive Julian. The funeral in the Nott Family Plot in England will be for family only but there will be a celebration of Julian’s life later in the year in Santa Barbara, California. Information will be posted on Julian’s website. In lieu of flowers, Julian’s wishes were for donations to his favorite charity, SEE International. Contact: Roberta Greene, Roberta.greene@icloud.com. For a fuller summary of his life, achievements and adventures go to his website. Interesting to hear that Phil Lawton’s old Hurricane has changed hands and is now in a private collection in southern Germany. The Hurricane XII ‘AG244’ (G-CBOE) is now out of its Finnish markings and back to its Rhodesian Air Force colours. Its new home isn’t that far from Schwabisch Hall, where we spotted it a few years ago, at Aalen Elchingen Airfield near Stuttgart, a business jet centre. 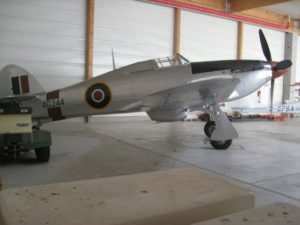 The new owner plans to base the Hurricane there alongside several other aircraft in a new hangar as part of his collection. Bet you were just thinking, “Haven’t had a TCDS update for a while.” Fear not, here are two, one from Balony Kubicek and one from Chaizybabes just to make up a paragraph or two and get you all excited. EASA.BA.017, the elusive Balony Kubicek Special Shape hot air balloon one, has leapt, in one bound, from issue 25 to issue 26, something that the main stream press didn’t twig, probably for reasons Brexit. Pretty exciting I reckon. The reason is the addition a 3300cubic metre special shape with the name ‘Handy’ MTOM is 995kg. Bet its jolly heavy. We inspected some new Kubicek stuff recently. Bit on that further down I dare say. Chaize Balloons, stuff of fantasy sipping red wine in the village square stuff, have popped into the frame for the second time this year. BA.015 (types CS,JZ,JZC,DC) went to issue 10 on 19/03/2019 with the addition of a 4,000cu.m. envelope CS4000 24 gore jobbie. Must get them in to official TCDS bit at some stage. Then, just when you thought it was all over those Spanish Spaniards at Ultramagic have moved HAB TCDS BA.014 to Issue 23. It mainly appears to be certification basis changes and in Section 7 with reference to Series N revised basket and burners and the N-450 Series B approval dates have also been amended. Ultramagic have been jolly busy in the paperwork department with the announcement that the Maintenance Manual has gone from Edition 4 Revision 17 to Revision 18. In addition the following Supplements have also been revised. Maintenance Manual Supplement 4 Iss. 5 [Solo/Duo]. Minor amnedments include PowerPlus Sport burner moves to the Maintenance Manual and Fig 21 added to 7.2.2 Non-Destructive Testing on the Duo. Maintenance Manual Supplement 10 Iss. 3 [Conversion charts]. Addition of Centigrade/Fahrenhiet conversion chart and additions to Volume conversions. Quite a useful little supplement actually. Maintenance Manual Supplement 11 Iss. 3 [Powerplus Sport Single Burner]. This mainly covers the Main Valve Remote Actuator Kit Assembly (if fitted). Maintenance Manual Supplement 12 Iss. 3 [Powerplus Sport Double Burner]. This appears to be a revision of the title. Maintenance Manual Supplement 17 Iss. 4 [Tekno Envelopes]. Bits and bobs added mainly in relation to approved materials and components. Maintenance Manual Supplement 18 Iss. 4 [Tekno Baskets]. Maintenance Manual Supplement 22 Iss. 2 [CV Vista Baskets]. These are the baskets fitted with seats and the revisions include checking the plywood to seat strusture fixings. Maintenance Manual Supplement 23 Iss. 3 [MK-32 Burner]. This covers the details about the slurper tube and the crossflow kit. There is a bit of other stuff including checking that the burner stops preventing rotation of the burner are working. They have also had a look at the Service bulletins and SB01/99 [Fisher M220M connectors], SB01/10 [Basket bottom frames] and SB01/11 [Burner frame inspection] have been embodied in the Maintenance Schedule in the Maintenance Manual. SB01/03 [Tape loops] is now completed so closed. All the Document(s) listed can be downloaded from the direct link(s) found in the Technical Support area on the Ultramagic website. Discovered by Elaine Smith this wondrous thing was produced by Initially Yours and embroidery company based in Bristol. They printed up a lot of the sweatshirts for Flying Pictures and very good they were to. I still have a few survivors but sadly most now have holes in them or have finally expired. Presumably this was a sampler. A quick look at the images dates it around 1990 but there are older balloons on display. We spotted the first J Bennett balloon, Union Jack (Flying Pics 180), Tickled Pink, Buckshot, Legal and General, possibly an early BT balloon and the conceptual Black Horse Balloon. G-BRZA Phil Dunston is there (now I the care of Tony Brown) and the red, white and blue one could be the first RAF balloon. There is also what might be Travel-Gas. The ride boys are there with Arthur Street’s ‘Exeter Balloons’ and, as it was then, Phil Clarkes ‘Bristol Balloons’. Halls Brewery (stuff the bear follow the hare), one-time sponsors of the Bristol Balloon Festival. It seems that Initially Yours are still in business whereas quite a few of these have ceased flying! No prizes for naming them all but would be interesting. Most famous one is the upper of the two balloons above Buckshot. It’s ‘Dollar’, the one Ray Bailey flew into a crane in Spain. The one joining it is possibly K-TEE. Black Horse flyers must have been regular customers then! Following the switch from magazine to annual publication the 2019 edition of the Propliner Annual will be published on Monday 15 April. The eagerly-awaited book has been extended to 144 pages with 20 feature articles illustrated with more than 300 photographs. Amongst the features is one on the BOAC Douglas DC-7C fleet, the DC Seven Seas. Two aircraft familiar at one time in British skies, but still flying, are in the book and take pride of place in our short preliminary review. Regulars at Coventry Airport will recall the Lockheed Electra fleet flown by Atlantic Cargo Airlines. Seen in the image is the 1961-built former G-LOFE, which saw UK service from 1982 until 2013 when it crossed the Atlantic, gained a new registration and had what is probably the cheapest makeover of all time. BTN editor-in-chief Malcolm Ginsberg has flown on this aircraft and also a Varig passenger version. The Buffalo story is written by Electra skipper Tony Jarvis, who has been flying Hercules and Electras in northern Canada for more than 30 years. With British Airways keen to promote the airlines that helped to create the UK flag carrier in 1974 the Erickson Douglas DC-7 is still being flown in Oregon as an aerial fire tanker. BOAC operated 10 of the type from 1956 to 1965. Copies of this bumper edition can be ordered from the website, simply by going to the Online Shop and selecting the '2019 Annual'. And for anyone wishing to supplement their "Propliner" reading, why not order a back issue or two, or even last year’s annual, at the same time? Anyone who has experienced difficulty in contacting the editor via email at editor@propliner.co.uk can use an alternative e-mail address at tmjpropliner@btinternet.com. Great news in that Kevin Meeham, who helped the Montygolfing brothers get airborne, has receieved the British Balloon & Airship Club’s highest accolade for long and, or, extraordinary service to the Club, Sport and Industry in being elevated from mere member to the status of Vice President. As can be seen on the committee and officers page of Aerostat, there are six current (living) Vice Presidents. At the BBAC AGM 2019, Kevin Meehan was awarded the status of Vice President in recognition of his many decades of work within the Club, notably in training and examining and work on the flying committee and examiners' panel, as well as to recognise his lifetime of achievement as a pilot and in managing projects with balloons and airships. Loads of congratulations to you sir for your tireless energy over the years helping so many to become pilots and to ensuring their have been instructors to do it. Just a reminder that the new regulations concerning cover-all fire blankets, pilot restraints, if you have turning vents disconnected or not, first aid kits the contents of which don’t fit in an underbed storage unit, knives that would be conviscated at check-in, comes into force on the 8 April (shame it wasn’t the first then we all could have had a jolly good laugh and ignored it). Then there is the in-flight escape system. Having studied the balloon Rule Book more thoroughly I can now put hand on heart and ask what ever happened to the Red Tape challenge? Although thoroughly sensible advice, in the main, the promise that it is written to be more understandable is cods. I have seriously revised my opinion of it. You need to spend a few hours just cross checking the GM BOP Bap with the AMC BIF BOT with the Article against the Regulation then over the ferret’s biscuit barrel, it leaves one confused at best. There are some seriously daft things in it. Competition flying is considered a specialist operation requiring a risk assessment. So if you are at your local friendly balloon meet and a competition is set of longest flight and first back to the launchfield then a risk assessment is due. How about flying with a cup of water, least spilt type of thing. The Long Jump will need a risk assessment. Let’s take a fly-in as a ‘competition’. Now read the Rule Book. It states in GM2 BOP.BAS.190 that ‘The pilot-in-command or the operator determines whether the main purpose of an operation is passenger ballooning, commercial or not, or whether the activity falls within the scope of a balloon specialised operation. As regards a balloon specialised operation, the pilot-in-command or the operator applies the criteria in AMC1 BOP.BAS.190 and the activities listed in GM1 BOP.BAS.190.’ Still with us? Right, checking AMC1 BOP.BAS.190, it says ‘CRITERIA FOR BALLOON SPECIALISED OPERATIONS. The pilot-in-command or the operator should consider the following criteria to determine whether an activity falls within the scope of balloon specialised operations: (a) special equipment is necessary to fulfil the task and which affects the behaviour of the balloon in flight; (b) external loads are lifted; or (c) persons enter or leave the balloon during flight. GM1.’ Now I can’t see any of those things being applicable so it isn’t. Losing the will I check GM1 BOP.BAS.190 and under ‘List of Operations’ at point 3 it says ‘special events flights, including flying displays and competition flights’. But we are not doing anything in AMC1 BOP.BAS.190 so why is competition flying there? Going back to GM2 BOP.BAS.190, if the pilot determines it isn’t a specialised operation then it isn’t is it? At best the information given is arse about face, confusing and has no grounds for enforcement. Now if you are lobbing someone out the basket then fair enoughish, but a Hare and Hounds? Well fair enough, it is now known as the Royal County of Berkshire Show but it is still fabbo. 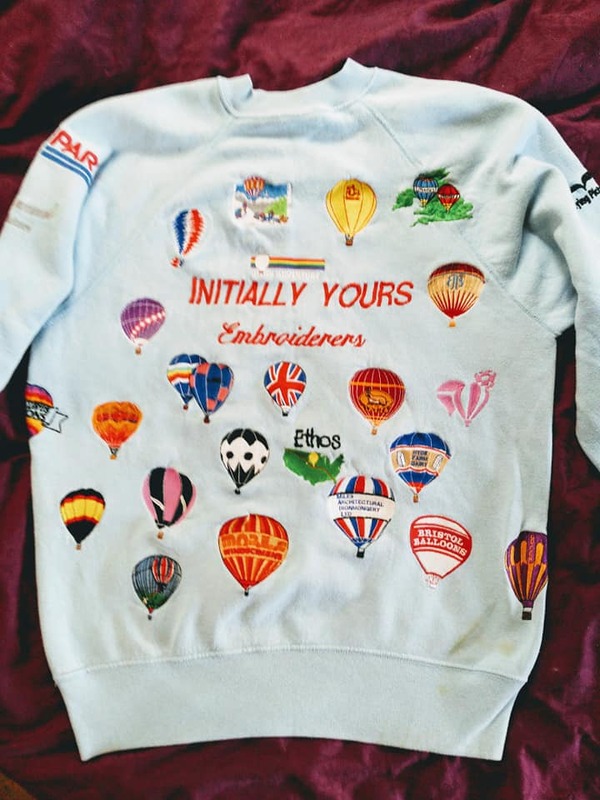 It is also one of the first to have hot air balloons flying out of the arena and this year even more splendiferous it is 35 years since that first happened. Whoa Ho. It will always hold a special place for us Old and Rusty Boys as it was the last event on the circuit and we once hung Andy Rawson’s basket from the crane that was usually by the entrance. He laughed and pointed until he discovered it was his. Sense of humour failure followed. That would never happen these days, of course, and anyway the 3-4-40 Region BBAC have pleasure inviting balloonists to come and join in over the weekend of Saturday 21 & Sunday 22 September 2019. With more than 60,000 visitors expected over the weekend, the event is the highlight in the local farming and ballooning calendar. As in previous years, flying will take place in the mornings and evenings with two showcase launches from the main arena. 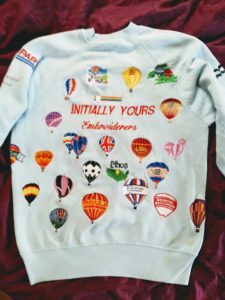 As 2019 is also a celebration of 35 years of ballooning from the Show, you can expect some surprises! Each balloon team will also be allocated four complimentary entry tickets for the show as a thank you for their participation. Accommodation within the area is always at a premium on show weekend so we advise you to book early to avoid disappointment! To get an application form please contact Jonathan Harris at events3440@hotmail.com. They need to be completed and returned by Friday 5 July. Further details on the show can be found on the website www.berkshireshow.com. An airspace infringement is the unauthorised entry of an aircraft into notified airspace. This includes flight in controlled airspace (Control Areas, Control Zones and Terminal Manoeuvring Areas), prohibited or restricted airspace (either permanent or temporary), active danger areas, aerodrome traffic zones (ATZ), radio mandatory zones (RMZ) or transponder mandatory zones (TMZ). Any airspace infringement has the potential to be a serious safety incident which may result in a mid-air collision or AIRPROX (where the distance between aircraft as well as their relative positions and speed have been such that the safety of the aircraft involved may have been compromised). In 2017 there were a total on 1165 airspace infringements reported through Mandatory Occurrence Report (MOR) or Alleged Breach of Air Navigation Legislation (ABANL) reports. Of these, 307 were investigated by the CAA's Infringement Coordination Group. Findings by the CAA suggest that, the correct use of a moving map could have prevented 85% of infringements and the correct use of a frequency monitoring code (also known as a listening squawk) could have prevented 65% of infringements. Recognition of, and dealing with, overload, fixation and distraction could possibly have been effective in 43% of cases and better familiarity with aircraft and equipment could also, possibly, have been effective in 24% of cases. The latest case went to court on the 5 March 2019, when a pilot pleaded guilty to four infringements of Luton Controlled Airspace in 2018. The pilot was ordered to pay £7,576 in fines. The infringements resulted from a number of failings that the CAA’s Airspace Infringement Coordination Group (ICG) is seeing repeated frequently. Fortunately, other airspace infringements rarely have such significant consequences as these occurrences. In September 2018, a C172 pilot departed Wellesbourne Mountford to fly to Duxford; his planned route was via the DTY VOR, Cranfield, Old Warden and Royston. He had planned the flight to take place in August, but it did not take place due to poor weather. He undertook the flight in September and infringed Luton controlled airspace on four occasions causing multiple losses of separation and disruption to aircraft which were broken off approach, issued with vectors and issued speed restrictions to remain clear of his aircraft. Departures from Luton Airport were suspended three times. The C172 pilot, concerned that he had become over-reliant on using moving map/GPS technology, had decided that he would navigate using a chart and visual reference points. 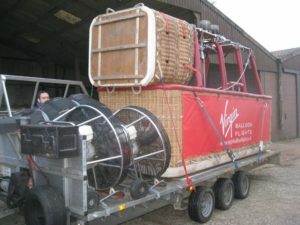 He used the same PLOG that he had prepared for the flight in August. In August, the winds were 260-280/6kts; on the day of the flight, Luton Airport was using Runway 08 and, at the time of his morning flight, the wind at 2,000 ft was north/northeast at 5 kts, increasing to 15 kts for his return flight in the afternoon. Outbound from Wellesbourne Mountford, after flying 40 nm, the pilot was 30 degrees right of track and some 14 nm south of the planned position. Instead of being overhead Cranfield, the pilot was overhead Cheddington. Prior to the first uncleared entry into controlled airspace, an inbound aircraft to Luton Airport had its descent stopped as a precautionary measure. The C172 entered the Luton CTA at 3,000 ft and flew along the final approach to Runway 08. This required avoiding action to be issued to the inbound aircraft. Despite the turn, separation was lost. Two other inbound aircraft were issued with control instructions to ensure that separation was maintained. The infringing aircraft then entered the Luton CTR necessitating all departures from the airport to be suspended. The C172 left controlled airspace to the south, between Hemel Hempstead and St Albans. Unsure of his position and thinking he was over the M11 (the aircraft was actually over the M1), the pilot called D&D and advised he was lost. The pilot was told he was over Hemel Hempstead and requested ‘a fix for Duxford’. The pilot could not locate Hemel Hempstead on his chart as it was on the fold. When asked, the D&D assistant advised the pilot that Duxford was 29 nm to the northeast. The pilot followed the bearing for Duxford. Six minutes after leaving controlled airspace, the C172 re-entered the Luton CTR on a north-easterly heading. Departures from Luton Airport were suspended again. The C172 flew within approximately 1nm of the runway at Luton Airport. Departures resumed when the aircraft left controlled airspace 8 minutes later. The return flight was unplanned; the pilot intended to reverse the route. The flight was going to plan until the ATC unit at Cranfield aerodrome requested the pilot flew further south. The C172 entered the Luton CTR at 2,500 ft, in the vicinity of Letchworth Garden City. Departures from Luton Airport were suspended for a third time. Two losses of separation occurred: an aircraft that was airborne from Luton Airport came within 1.1 nm of the C172 and an aircraft on approach lost separation with the C172, which was flying parallel to Runway 08 at 2,100 ft. The C172 continued to the west and left controlled airspace in the vicinity of Dunstable 4 minutes after entering. This is the full version of the report cited above https://airspacesafety.com/updates/?mc_cid=abe43230a2&mc_eid=5b3b56b6e7. The RAF Museum Hendon has introduced one of the most innovative exhibitions in its history. Visitors can now take a virtual reality ride on an Avro Lancaster to attack the Möhne Dam. Participants need to don a VR headset and haptic vest bringing the real feel and presence of being in the radio operator’s seat in the bomber. It is so realistic that by standing up one can see the pilot, flight engineer and navigator all at work and view out of the side window the Norwegian forests during the low approach. The vest and headset fantasise the vibration and roar of the four Rolls-Royce Merlin engines. Unless you have already flown the device, participants seem a little weird jumping up from their seats and clearly looking for something that is in cyberspace. Olie Kay of All Seeing Eye, the company that created the ride, said: “This experience isn't about explaining all the facts of the mission. It's about exploring the human story of the real people who were on the aircraft and communicating an authentic sense of place what it may have been like to be there.” Entrance to the RAF Museum and Dambusters exhibition is free. The Lancaster ride is £10. RAF Hendon is a 5min walk from Colindale Station on the Northern Line. Proposals from the European Aviation Safety Agency (EASA) for a unified set of drone rules for all EU countries gained a final adoption (approval) at the end of February. Although substantially revised it follows the general principles published by EASA in February 2018 in its Opinion 2018-02. The Implementing Regulation (rules) is expected to be published in early summer 2019 and will become applicable 12 months later (June 2020). Once the final regulation is published this summer we will provide details on UK adoption plans. Meanwhile the First Person View General Exemption for Small Unmanned Aircraft has been reissued. Operators of small unmanned aircraft (drones) using ‘first person view’ (FPV) equipment should note that the General Exemption which permits this activity has been amended in order to accommodate the changes to the Air Navigation Order 2016 (see CAP 1763 ) which came into force on Wednesday 13 March 2019. A summary of these changes can be found in CAP 1763. The following General Exemptions have been issued, which reflect these changes. The following new General Exemptions have been issued, which are now effective. ORS4- 1296: Small Unmanned Aircraft – Control Line Model Aeroplane Flight Within Flight Restriction Zones. Freddie Laker is, without doubt, one of my heros. It was he who kicked off affordable long haul air travel with his Skytrain service across the Atlantic and was subsequently harassed out of business by many of the leading airlines of the day. He later sued the IATA member airlines for ‘predatory pricing’ and substantial out-of-court settlements were made. As a mark of his honourable nature the awards enabled him to pay off his outstanding debts. My respect for him really goes back before Laker Airlines (got the T-shirt) when he realised the potential for surplus aircraft after the end of the Second World War. He set up Aviation Traders at Southend Airport which not only salvaged parts from ex-WW2 aircraft but also converted many bombers into transport aircraft including the Halifax which took part in the Berlin Airlift. 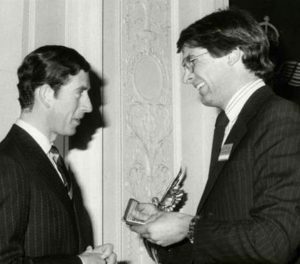 He went on to convert DC4s into Carvairs, front loading car carriers, became the managing director of British United and developed low thrust take-off and engine saving techniques on BAC 111s and set up Gatwick Handling. Apparently after making his first fortune from the Berlin Airlift he realised the market was flooded so set to at Shorham smelting 6,000 engines for a saucepan manufacturer and then introduced the ‘Stop me and Buy one’ ice-cream man to Nigeria. Urban Myth maybe, hopefully all will be revealed in this book. 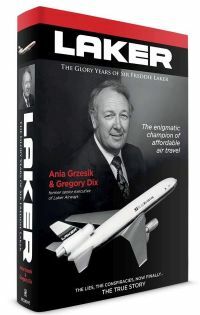 'LAKER - The Glory Years of Sir Freddie Laker' is in hardback with 608-page, three 16-page galleries and more than 300 images about the remarkable life of Sir Freddie. The book is co-authored by Gregory Dix, ex-Monarch, Gatwick Handling and Laker Airways and Ania Grzesik. This is promised to be the true story of Sir Freddie and rather intertestingly it is labelled ‘Part 1’. Best leave a gap in the bookcase then. ISBN 9780995648609 £20 Published in the UK by Recursive Publishing Ltd. www.recursivepublishing.com. By now it will be less from Amazon! In a statement from good old British Airways it has been confirmed that they have ordered 18 B777s with an option on 24 others to replace its ageing Jumbo Jets. The order has been placed by International Airlines Group (IAG) for British Airways. They will be used to replace 14 Boeing B747-400s and four Boeing B777-200s between 2022 and 2025. The new aircraft will be fitted with 325 seats in four cabins and powered by General Electric GE9X engines, with the engine order including a comprehensive maintenance package with GE. IAG CEO Willie Walsh said: “The new B777-9 is the world’s most fuel efficient long-haul aircraft and will bring many benefits to BA’s fleet. It’s the ideal replacement for the B747 and its size and range will be an excellent fit for BA’s existing network. This aircraft will provide further cost efficiencies and environmental benefits with fuel cost per seat improvements of 30% compared to the Boeing 747. It also provides an enhanced passenger experience.” Currently BA has 135 wide-body long-haul aircraft in its fleet – 12 A380s, 30 B787s, 12 B777-300ERs, 46 B777-200s and 35 B747s – with 12 more B787s, four B777-300ERs and 18 A350s on order. As we go to print it will be Timbo Day 2 and guess what the man himself has found a piccie of? Yup, Concorde Beer. 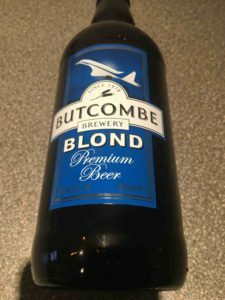 Its Bristol-brewed Butcombe Beer and the date they started? Well it was 1978. Is the bottle still a go-go? Saw a pic of a more modern design but featured a more head on version. Good thing is that 4.5% is eminently quaffing beer. Here’s thing. Freddie Laker was voted man of the year in 1978, the year Butcombe Brewery got started. We need to have a word I reckon.